Tacos are everywhere in Ann Arbor…and the country, really. Delicious tacos are so abundant that I could easily plan an itinerary for a taco bar crawl guaranteed to leave you happy and stuffed to the brim with carnitas. We’ve embraced the authentic street food style and kicked the “Old El Paso” and “Taco Bell” versions to the curb. Call me pretentious, but if you put shredded American cheese and grimy ground beef anywhere near my corn tortilla I’ll slap it right out of your hand. Although I still dearly love a good taco, I'm ready for something new. For this review I have my adventurous boyfriend, Bryan, to thank for spicing up my palate. To my absolute shock he went rogue and ordered a traditional entrée that wasn’t tacos. I'd like to introduce to you to my new culinary love, Mi Compadre’s Polio en Mole. The mole sauce is so good that I would have no problem filling a Nalgene bottle with it so I could take sips all day long. 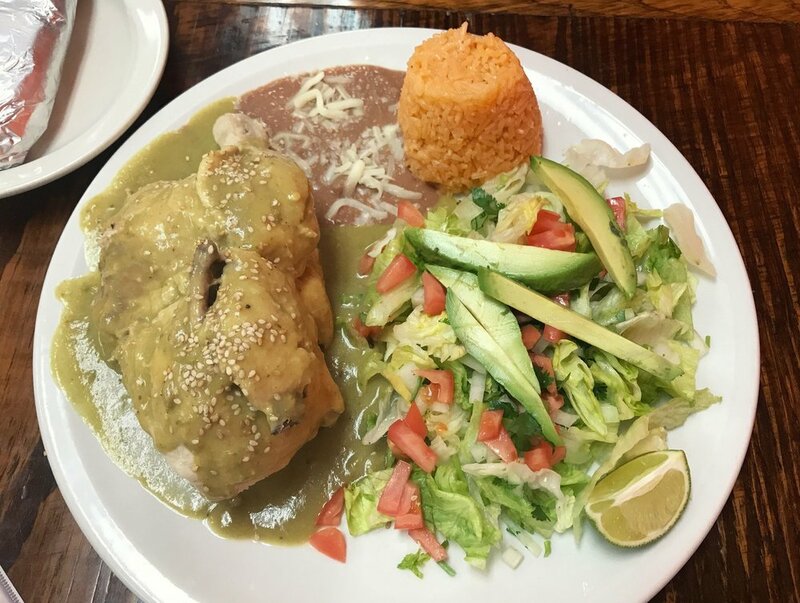 The word "mole" technically refers to any sauce used in a Mexican dish, and the ingredients vary depending on the chef. I have no idea what Mi Compadre puts in their mole, and I wouldn't dare ask their secret, but it keeps me coming back. The tender chicken fell off of the bone, and to my heart’s delight, the entrée came with an avocado topped salad. As I experience new Mexican cuisines, I’m realizing how fooled I’ve been by nacho-cheese laden Tex-Mex. Traditional cuisines are nutritious and loaded with flavor, and my vegetable loving heart rejoices. Another top contender for my money and taste buds is the Caldo de Mariscos; a tomato-based soup with an abundance of seafood. It's hot, comforting, and enjoyed any time of the year, but I really got into it during the winter months. I should also mention, their tacos truly are worth the order. It's just that now I request them a la carte, to save room for the mole. But let's get to why I really enjoy stepping through the doors of Mi Compadre and put it at the top of my list: the hospitality. The restaurant itself is simple with a few design touches that set the mood, but it never fails that when we walk through the doors we are greeted warmly by the owners. It truly feels genuine, not the “I’m going to smile at you because I want your money” greeting. The food is fantastic, but the people make it a place to remember. Since my first mole encounter I have moved across town, but rest assured, I still find time to get my Polio en Mole fix. The difference is I have to hold off and eat dinner later, because Ann Arbor traffic will send me to my grave. Go for the mole, stay for the service, and return because both are that good. Click HERE to access Mi Compadre's Facebook page and check out theirmenu for yourself!